Home / News / Can smelling your food make you fat? What’s weird, however, is that these slimmed-down but smell-deficient mice ate the same amount of fatty food as mice that retained their sense of smell and ballooned to twice their normal weight. In addition, mice with a boosted sense of smell — super-smellers — got even fatter on a high-fat diet than did mice with normal smell. The findings suggest that the odor of what we eat may play an important role in how the body deals with calories. If you can’t smell your food, you may burn it rather than store it. “This paper is one of the first studies that really shows if we manipulate olfactory inputs we can actually alter how the brain perceives energy balance, and how the brain regulates energy balance,” said Céline Riera, a former UC Berkeley postdoctoral fellow now at Cedars-Sinai Medical Center in Los Angeles. Humans who lose their sense of smell because of age, injury or diseases such as Parkinson’s often become anorexic, but the cause has been unclear because loss of pleasure in eating also leads to depression, which itself can cause loss of appetite. Riera noted that mice as well as humans are more sensitive to smells when they are hungry than after they’ve eaten, so perhaps the lack of smell tricks the body into thinking it has already eaten. 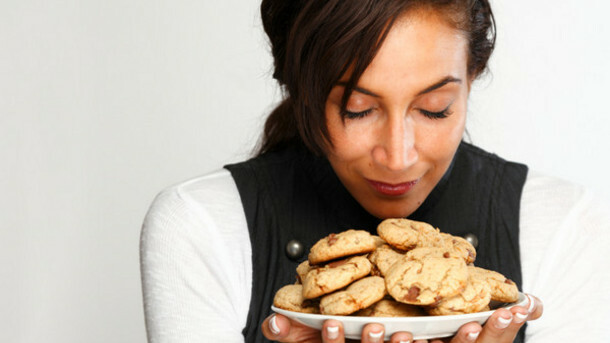 While searching for food, the body stores calories in case it’s unsuccessful. Once food is secured, the body feels free to burn it. The researchers used gene therapy to destroy olfactory neurons in the noses of adult mice but spare stem cells, so that the animals lost their sense of smell only temporarily — for about three weeks — before the olfactory neurons regrew. The smell-deficient mice rapidly burned calories by up-regulating their sympathetic nervous system, which is known to increase fat burning. The mice turned their beige fat cells — the subcutaneous fat storage cells that accumulate around our thighs and midriffs — into brown fat cells, which burn fatty acids to produce heat. Some turned almost all of their beige fat into brown fat, becoming lean, mean burning machines. In these mice, white fat cells — the storage cells that cluster around our internal organs and are associated with poor health outcomes — also shrank in size. The obese mice, which had also developed glucose intolerance — a condition that leads to diabetes — not only lost weight on a high-fat diet, but regained normal glucose tolerance. “For that small group of people, you could wipe out their smell for maybe six months and then let the olfactory neurons grow back, after they’ve got their metabolic program rewired,” Dillin said. Dillin and Riera developed two different techniques to temporarily block the sense of smell in adult mice. In one, they genetically engineered mice to express a diphtheria receptor in their olfactory neurons, which reach from the nose’s odor receptors to the olfactory center in the brain. When diphtheria toxin was sprayed into their nose, the neurons died, rendering the mice smell-deficient until the stem cells regenerated them. In both cases, the smell-deficient mice ate as much of the high-fat food as did the mice that could still smell. But while the smell-deficient mice gained at most 10 percent more weight, going from 25-30 grams to 33 grams, the normal mice gained about 100 percent of their normal weight, ballooning up to 60 grams. For the former, insulin sensitivity and response to glucose — both of which are disrupted in metabolic disorders like obesity — remained normal.